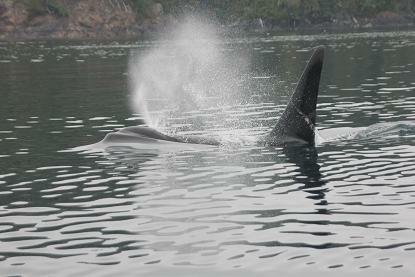 A choice that guests make when photographing orca : Is it better to have an exhaled breath or the white eye patch in the photo? Your choice. The left edge of the photo is a guest trying to get a good picture of a humpback whale, on a tour, that surfaced close to our boat. 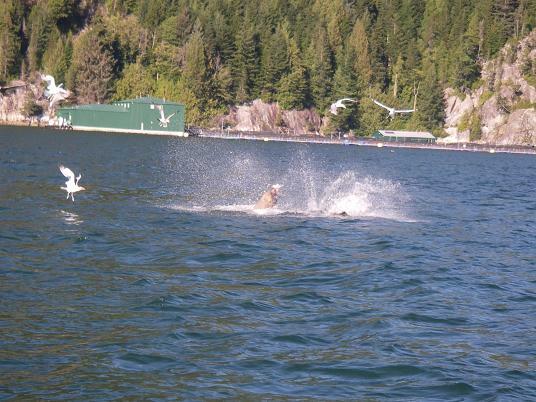 When the whales are feeding in our area on the BC coast the best action is no action. That means find a herring ball and sit and wait, running after the whales just creates to much disturbance and they tend to move off to another area. 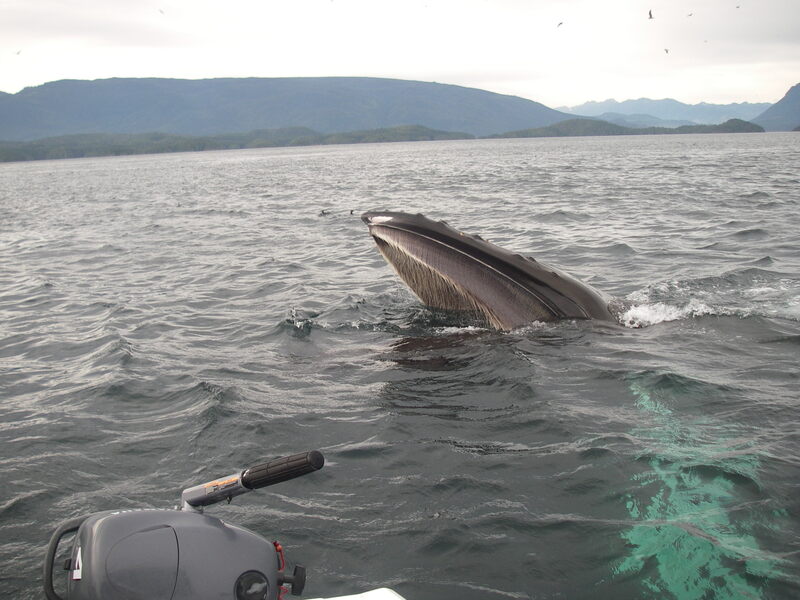 We have a number of humpback whales that summer in our viewing area so the problem is often to “guess” which side of the boat will provide the beat picture. I can think of worse problems. 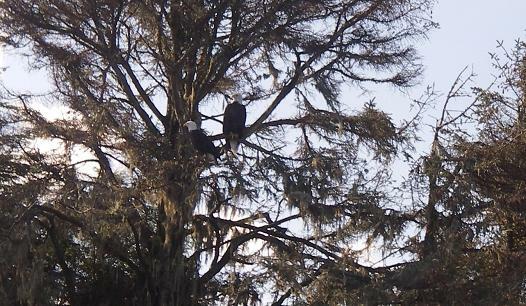 Bald eagles are a common sight in our tour area. As one of our guides says to his guests: “I will point out the first ten eagles and after that you are on your own.” This does not mean we don’t stop to get a good photo but that means when the eagle is a little lower down in a tree and not a white spot on the top of a tree. The waiting aspect of the photo is because that is what eagle do. 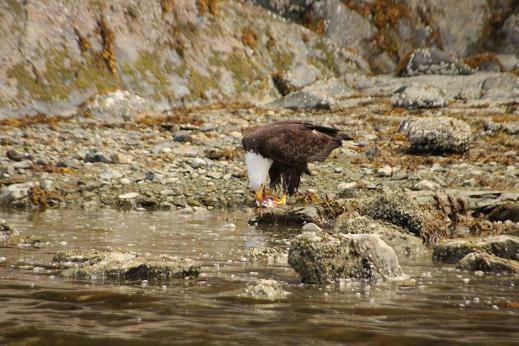 They wait for a salmon on the surface or a herring ball to form to provide a “chance” for a meal. The dark raccoon eyes and the upright poise made me think of the Meerkat of South Africa. 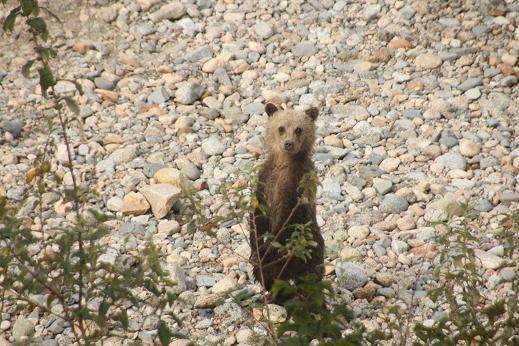 This cub, one of three, was passing by the viewing platform we use in Knight Inlet when one of the guests made a noise when a bench was bumped. The others kept moving but this one stopped and looked in our direction for a minute or so before moving to catch up with it’s family. The viewing platforms are raised about three meters (yards) above ground level and grizzly bear’s frequently glance our direction as it is not normal for them to have something above them. It is September 1st and these grizzly bears are looking like they need a good meal. And they do because not many salmon have arrived in the river. 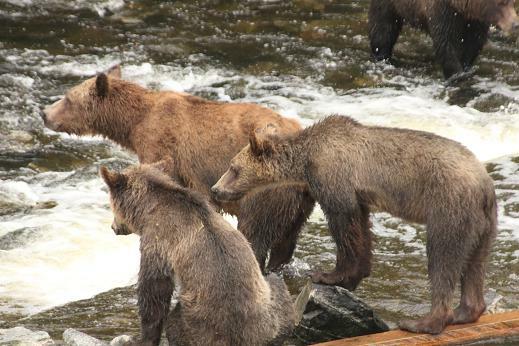 A late arrival of salmon to Knight Inlet’s Glendale River means that the bears have less time to fatten for hibernation. 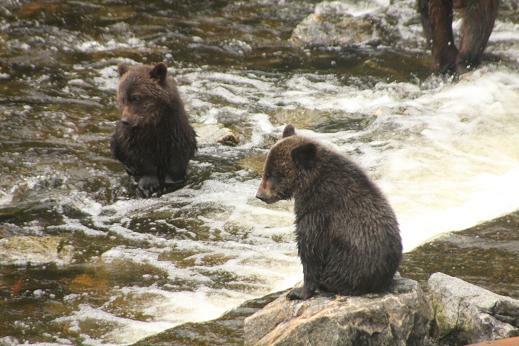 By early October the grizzlies were in better shape but it will still be an interesting winter for some of the younger bears and only next spring will we may see the result of a poorer salmon run. These grizzly bear cubs have decided that comfort is in numbers and body heat is conserved in a huddle. Yes these cubs are from the same mother and one is very small. Unfortunately it did not survive to the end of our viewing season which was mid October. Our guest are frequently reminded that this is not a zoo rather we are viewing wildlife in their natural habitat and nature is not forgiving. 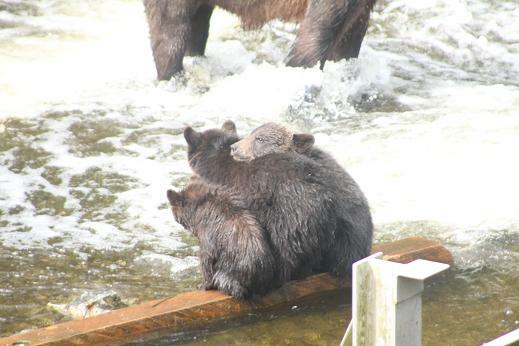 For some reason grizzly bear cubs will try to avoid getting wet. 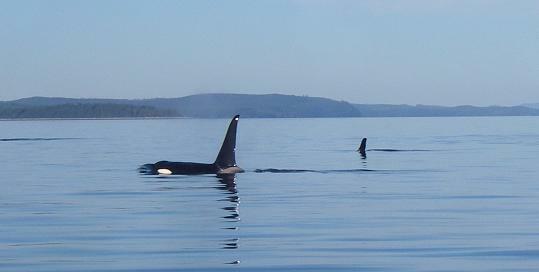 In the spring when the cubs are on the beach and are required to enter the water it is often necessary for the mother to go ahead and leave them behind to force then to swim to join her further along the beach’s of Knight Inlet. In this case it is early September and the cubs still prefer to stay dry. It may be that their body fat level is not enough to overcome the cold water and this thought is reinforce by tomorrow’s post…. Humpback whales are identified by the underside and trailing edge of their tail flukes; each one is different just like a fingerprint. 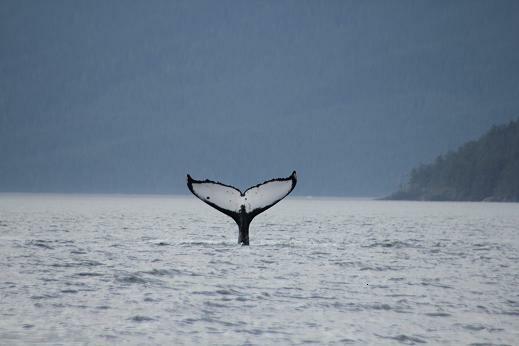 In British Columbia humpbacks are given a letter as part of their identification to categorize their fluke based on color. X animals have mostly black tails with less than 20% white on their fluke, Y animals have a fluke that is 20-60% white, while Z animals have more than 60% of their fluke white. 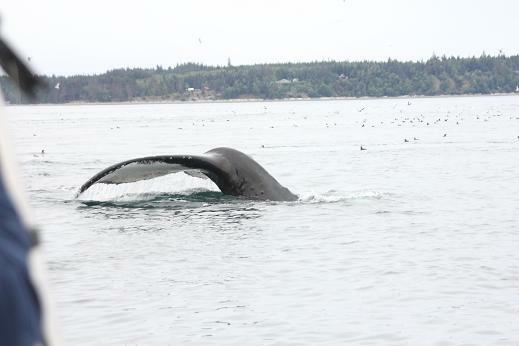 Humpback whales often show these tails, or ‘fluke’ while diving, making them ideal candidates for photo-identification projects. 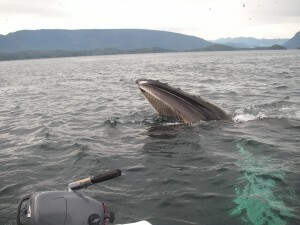 This photo is of a humpback that we frequently see on our whale watching tours, it is called ‘Guardian’. 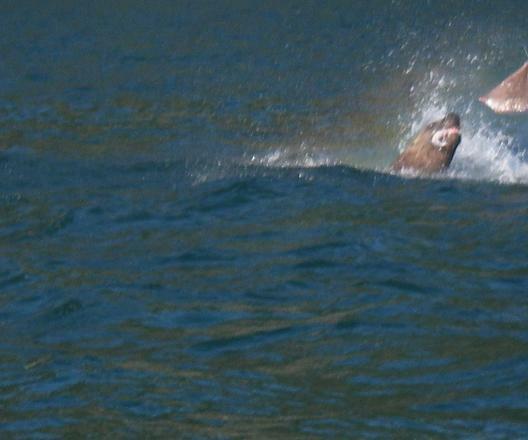 Steller sea lion feeding on salmon? Steller sea lions on the BC coast most often catch and eat their food under water however if it is larger then they come to the surface. The process has the sea lion whipping their head back and forth until they rip a mouthful out of their catch. Once that is swallowed they dive down and pick up the catch and repeat the performance until it is all consumed. The first photo shows the whipping process and the second is all I could get of a close up of the sea lion with a mouthful. From the second photo this appears to be a halibut or some other flounder style fish.